Do you have a DJ? or MC for your event? Do you want to save hundreds of dollars and just rent the equiptment? Daily rentals and even weekly or monthly rentals may be available to you. Below are 24 hour rental prices (1 day rental) for your event. Please enquire as to availability if interested. 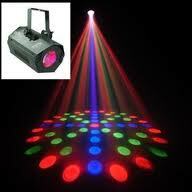 Basic sound system includes Yorkville powered mixer with 2 speakers, speaker cords and 1 wired mic. 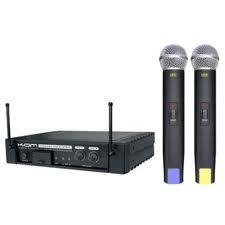 Also, (if requested and available) at no extra charge, an extra microphone, extension cords, and speaker stands. Yorkville is a quality Canadian brand that produces excellent sound for recorded and live applications as well as speeches. *For weekly and monthly rentals please enquire. 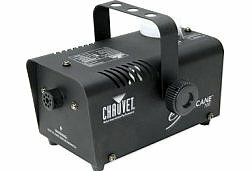 Chauvet LX15 tri color moonflower LED sound activated. 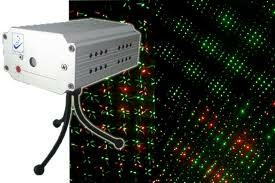 Big Dipper M015RG mini Red & Green Laser lights. 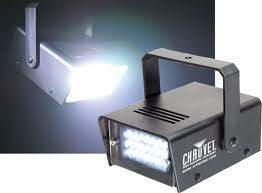 Chauvet Mini Strobe LED speed control. 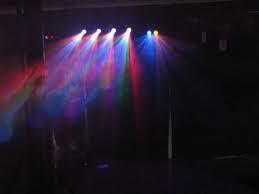 To the left you can see the effect it has with lights, Fogger pictured to the left and below. Laptop comes with a great selection of music. Portable flat computer screen for Karaoke.